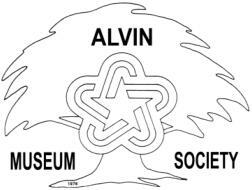 The Alvin Museum Society will hold a quarterly meeting on Sunday, November 21, 2004, at 2:00 p.m. in the Texas Room of Alvin Community College Student Center. The meeting will be followed by introduction of the 13th annual 2005 local history calendar. 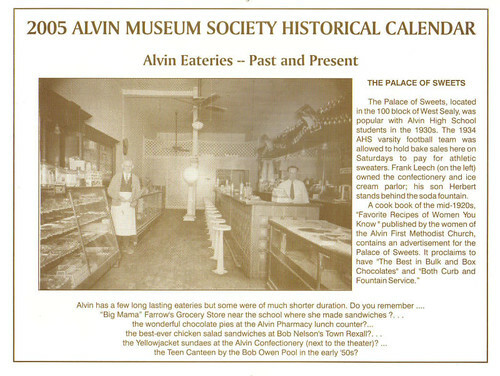 Featured are "Alvin Eateries--Past and Present." Calendars are $7.00 or $8.50 if mailed. The public is invited to attend the meeting and enjoy refreshments and visiting. Marilyn Monroe, Johnny Cash, Frank Sinatra, Patsy Cline, and other entertainers impersonated by Alvin notables will perform on Saturday, November 13th. Billed as "Another Evening with the Stars", this musical revue is hosted by the Alvin Museum Society Fund Raising Committee. Festivities include a seated dinner, silent auction, and great entertainment. For tickets and more information, call 281-388-0616. Proceeds from this event benefit the Alvin Historical Museum exhibit fund.